(Vegan) Mac & Cheese, If You Please! Mac and cheese, if you please, can’t you see I’m on my knees? Did anybody else watch the Disney cartoon, Pepper Ann, back in the day? It was a pretty creative show about a quirky 12-year-old girl, which was exactly what I was when it first appeared on TV, so there’s no doubt why it became a big favorite of mine. The third season started with a musical episode which featured songs about everything in Pepper Ann’s life, including, you guessed it, dinner. More specifically, mac and cheese! I’ve fed her nothing better than elbow noodles dipped in cheddar! Vegans seem to have a special obsession with mac and cheese. While I can’t say I share the love to that extent, I do have many fond memories of inhaling big bowls of the electric-orange boxed variety when I was a kid. Of course, now that I know what’s in it, I would never touch it again even if I did still eat cheese. It pleases, tempts and teases, all the scrumptious blends of cheeses. I’ve tried many different vegan mac and cheese recipes, from big pans of baked noodles with tofu-based “cheese” to quick stovetop nutritional yeast sauces that remind me of a cheesy noodle mixture my mom used to make when I was growing up. One I hadn’t tried yet was the silken tofu/nutritional yeast blend in Baked Shells & Cheese from the Happy Herbivore Cookbook. Since pretty much all the recipes in the book are simple and, of course, delicious, that one was my next choice. The ingredients are pretty traditional and straightforward when it comes to vegan mac and cheese: Mori-Nu tofu, nutritional yeast, salt and pepper, turmeric, paprika, and a little water to get the right saucy consistency. 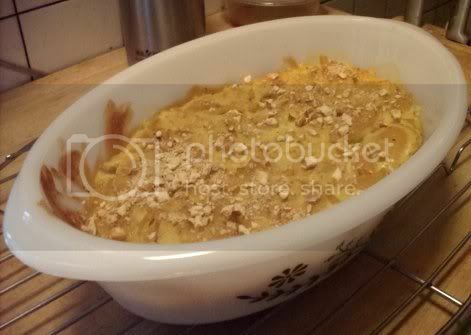 Then for the perfect comfort food touch, it all gets tossed in a casserole dish, topped with bread crumbs, and baked. (I found that oval casserole dish hanging out in our buffet cabinet. Isn’t it cute?) 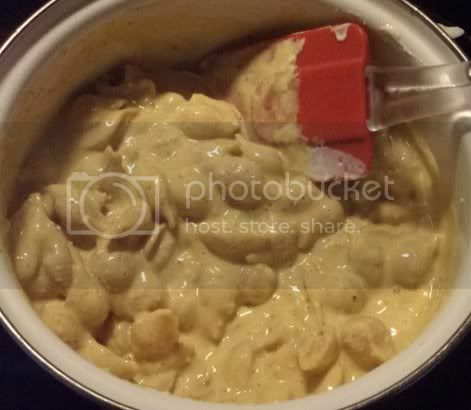 The result is a warm, creamy dish with all the enjoyment of traditional mac and cheese. I was happy that I actually had shell pasta around to make this with; it held the sauce well and heck, it was kind of adorable, too. 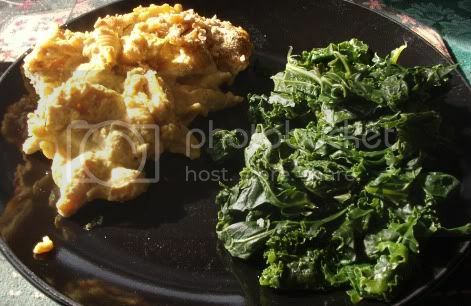 I usually do a green vegetable as a side to pasta dishes, so I served this one with kale. I don’t care if I’m wrong or right, but I could eat mac and cheese every night! As long as it’s vegan, of course!